"How SARS Chained Me To Their Vehicle, Detained Me For 8 Days"
Operatives of the Special Anti-Robbery Squad, Abuja, have been accused of unlawful arrest and detention of some residents of Makun, Sagamu, Ogun State. It was learnt that the operatives detained the victims – Abdulrahman Abdulkabir, Chief Idowu Sanya and Dauda Owolabi – for eight days. One of the men, Sanya, alleged that the operatives chained him to their operational vehicle from Sagamu to Abuja. The Punch reports that he said the policemen released them after they had spent eight days in custody, telling them to go home and make peace over an expanse of land in the community. He said, “On Monday, March 24, 2018, I visited the palace of the Ewusi of Makun. Shortly after I left the palace around 10pm, some SARS operatives intercepted me. They ordered me into their vehicle. They also arrested two other residents (Abdulkabir and Owolabi). “None of us knew why we were arrested until they finally took us to Abuja. It was more like abduction, as they never produced any warrant of arrest. “They first drove us to the SARS office in Magbon, Abeokuta, and put us in a cell for three days. On Thursday morning, they took us to Abuja. 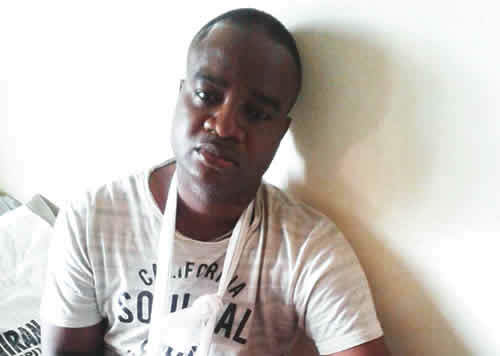 “My right arm was chained to the body of the vehicle with handcuffs all through the journey from Sagamu to Abeokuta and from Abeokuta to Abuja. Sanya said they were no longer safe and urged the authorities to come to their aid. Abdulkabir said he was defecating in the toilet when three policemen barged in. “They didn’t even allow me to put on my clothes before taking me away. I was in a pair of boxer shorts. Throughout the three days we spent in the Magbon cell, I slept on the floor, wearing nothing but the boxer shorts. The most painful part of the story was that the policemen discovered that my name was not listed in an alleged petition that led to our arrest when we got to Abuja,” he added. According to Owolabi, the third victim, the operatives did not give them food throughout the three days they spent in Magbon. Owolabi explained that they spent five days in the SARS custody in Garki, Abuja. He said they were accused of assaulting some people over the ownership of an expanse of land at Simawa town, in the Sagamu West Local Council Development Area. “Surprisingly, the people we were accused of attacking were the same individuals our families had recently reported at the Police Area Command, Sagamu, over alleged encroachment and forceful occupation of our families’ land in the Agbodu area of Simawa. “On two different occasions, these land grabbers were invited by the police in Sagamu, but they refused to show up, only to turn round to accuse us through a flimsy petition,” he added. The Police Public Relations Officer in Ogun State, ASP Abimbola Oyeyemi, said the SARS operatives were not from the state command. He, however, said it was false that the residents were apprehended and detained without being told the reason for the arrest. The Force Public Relations Officer, ACP Jimoh Moshood, was said to be in a meeting when contacted on the telephone. He had yet to reply to an enquiry sent to his phone on the case as of press time.